Question: Woodpeckers are pecking holes in my trees. Why are they doing this and will it kill my trees? The bird who is pecking holes in your trees is a Yellow-bellied Sapsucker, a member of the woodpecker family. 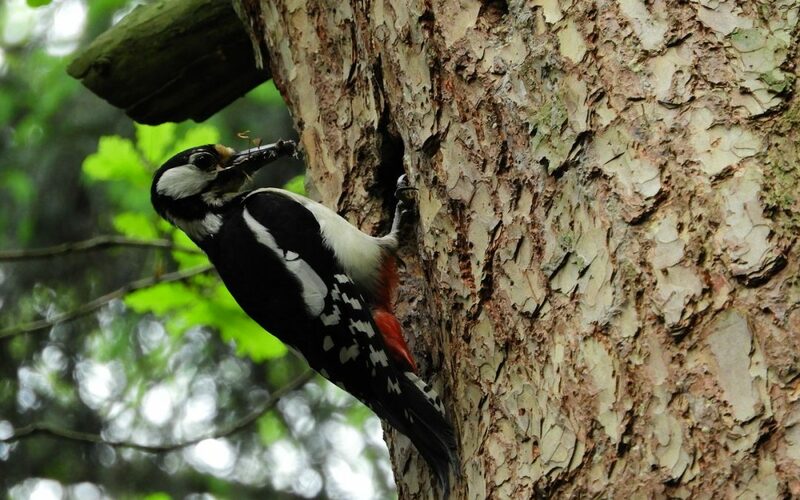 Whereas most woodpeckers will drill holes in trees, or poke under the edge of the bark, for hidden insects, sapsuckers have a more unusual method for feeding. Sapsuckers drill lines of small holes along a tree trunk, which soon start to leak sap. In some cases, the bird will actually drill several parallel lines so the tree looks as if someone drew a grid of dots along the trunk. After a few hours, the sapsucker will return and lap up the leaking sap using its long tongue. Since tree sap is made up of water and sugar, it is an excellent food for birds. In addition, tree sap is quite sticky so small insects will often get stuck in the sap. The sapsucker will also eat these insects as it laps up the sap. (It’s kind of like a “bowl of ice cream with chocolate chips stuck on the top” for birds). Trees have a great system for dealing with holes in their bark; a woody tissue will grow over the holes, similar to the tough scab that grows over cuts and scrapes that people get. The new wood will seal the hole and prevent fungal infections along the trunk. So a few lines of sapsucker holes shouldn’t harm a large tree. However, a couple of sapsuckers can cause considerable damage to a young tree. If you have small trees you want to protect from possible sapsucker damage, tying brightly colored mylar strips to some of the braches and along the trunk should convince the sapsuckers to stay away.